A rail firm has cancelled all Saturday services on its only route because all of its trains are broken. Hull Trains - which travels from the city to London - said the disruption was down to "more trains than usual needing repairs at the same time". Its rolling stock had already been reduced after an onboard fire at Grantham on 5 October. The company apologised and advised passengers to keep checking its website. On Monday, the company said timetable disruption as a result of the fire was due to finish before the weekend. Louise Cheeseman, Hull Train's managing director, said earlier this week the company's trains were 18 years old and did 1,000 miles a day. The trains were "getting a bit older and needed more TLC" and "unfortunately parts do fail on them", she added. Craig Johnson, of the RMT union, said: "Faults and breakages do happen but to lose all your train units and have to cancel all your services is a pretty catastrophic state of affairs." 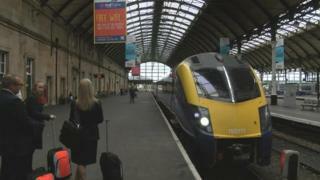 Emma Hardy, Labour MP for Hull West, had previously said the trains were "not fit for purpose". Image caption On a full service the company runs 92 services to London each week. The cancellations coincide with further strike action by the RMT union, with operator Northern running about 30% of its usual services from Cumbria, Merseyside, Yorkshire, the North East, Lincolnshire. Hull Trains is to introduce a new fleet in 2019 but before then the company had to "focus on maintaining our trains", Ms Cheesman said.